By the time we got up, Bryan was already up and making breakfast. It was really nice of him and we appreciated the tasty breakfast. 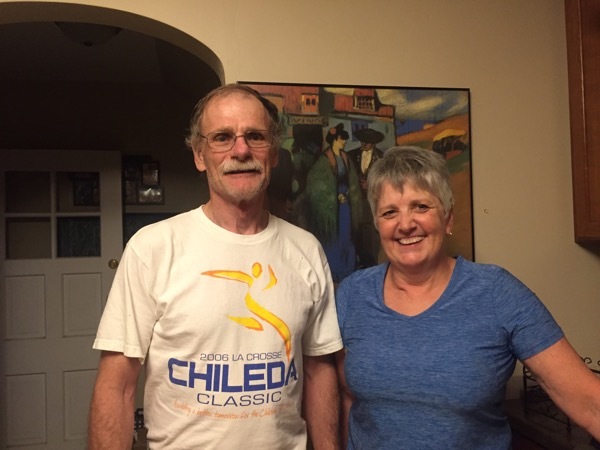 We were glad that we were able to stop in Alma and spend time with Bryan. The first 45 minutes of paddling was against pretty strong winds. We were worried that it was going to be that windy all day, but luckily the wind let up and we had some good paddling. There were several tiny towns we passed by that were very quaint and adorable nestled between the river and the bluffs. We made it through the first lock without any delays and then found a nice bit of sandy beach for lunch. It was a bit chilly today and we were told that there was a chance of rain. When the second lock of the day came into view, we could see a barge entering the lock. We called the lock master and were told it would be an hour wait. While we were waiting, it started to rain and then continued for the next two and a half hours. Luckily, it wasn’t too cold and we were able to stay warm when we paddled. When we started looking for camping sites, we checked out four different spots within about 1.5 miles, and all were overgrown with poison ivy. After the fourth, we could see an RV campground down the river, so we decided to head there and ask if we could camp. It seems to be the kind of place where people set up for the season. 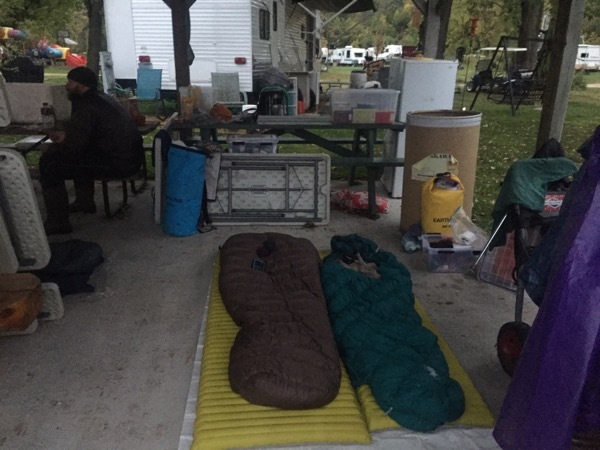 We only saw two people and they said we were welcome to camp anywhere, so we set up in the covered picnic area (the grounds are too open to have any hammock options). We are pretty close to the train tracks, but hopefully with ear plugs, we’ll be able to get a good night of sleep. As we started out this morning, there was a barge which passed us pretty early. 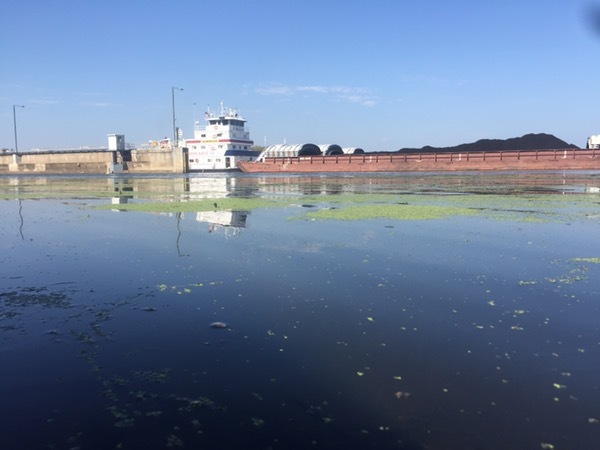 Since we had a lock coming up in four miles, we tried to stay within sight of the barge, so that we might be able to skip ahead of them and get through the lock quicker. It seemed to work, as we called the lock and were told that we would be the next to go through. There was a barge in the lock at the time, but we would only need to wait twenty minutes. We were pretty happy, as we wanted to get into LaCrosse earlier in the day. Whenever we are heading into a town, we want to get in as early as possible. Once we got through the lock, we had about 11 miles of paddling to the second lock of the day. As we came around the corner to the next lock, we could see several barges lined up in the shore…never a good sign for getting through a lock quickly. We called the lock and we’re told that a barge had just started the locking process, but that we would be the next through. That barge took almost two hours to go through. 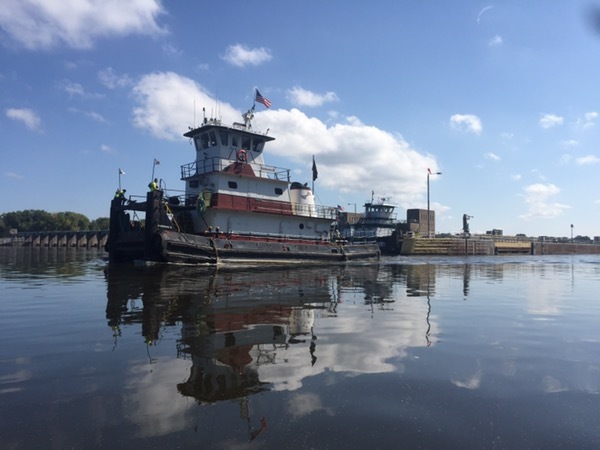 When a load is too big for the barge and tugboat to fit in the lock together, they have to put the barges in first, lock them through by winching them out the other side, then locking through the tugboat separately. It just takes so long. When we lock through, it is only about 15 minutes.  We only had another five miles to LaCrosse after the second lock, and the winds had started to pick up. 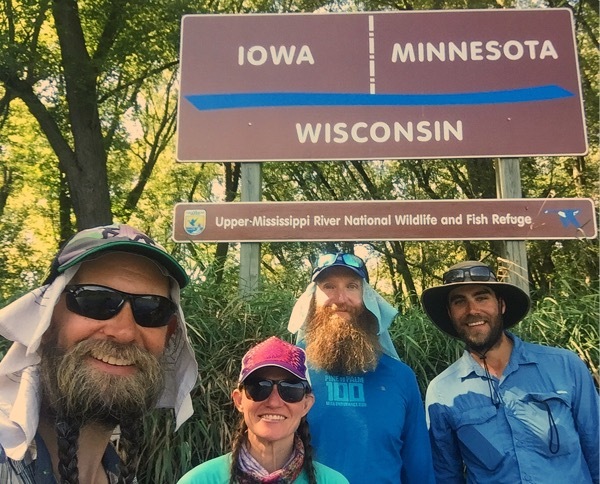 We were glad to have a shorter day, and we were met in LaCrosse by John Sullivan, who is a river angel, and who has immense knowledge of the river after having worked with the WI DNR for a lot of his career. He helped us store our canoes and brought us to our motel. In the evening, him and his wife, Beth, had us over for a wonderful dinner. We had a great time talking with them and hearing about his canoeing adventures. He knows so much about the Mississippi River and it was great to get some tips from him. Their kindness and generosity were very much appreciated. We had a great time relaxing in LaCrosse on our zero. 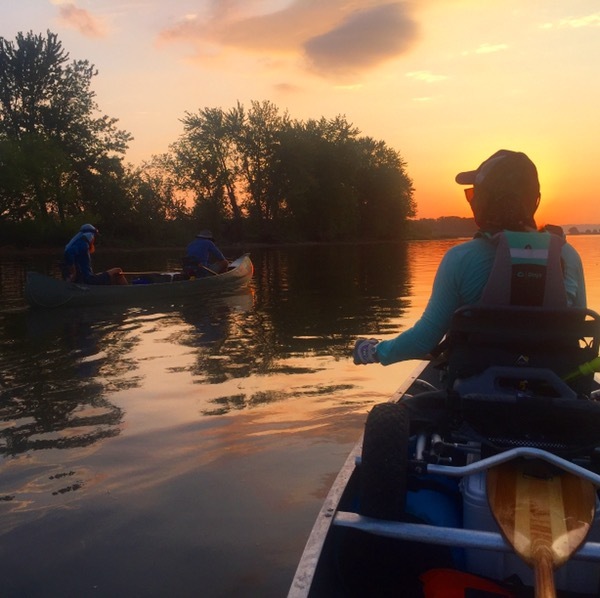 John Sullivan continued with his generosity, driving us to grocery shop yesterday and bringing us and our gear back to the canoes this morning…he even gave us a care package as we were leaving. His help and advice were really invaluable. We headed out on the river at 7:30am. It was quite calm on the water which was great, because we had thought today was supposed to be windy. There were quite a few fishermen out on the river today…mostly in bass boats speeding down the river, but they create such a small wake even when they are going fast that we didn’t mind them. We got to our only lock for the day around 11:30am. There were no other boats in line, so we were able to get through pretty quickly. We found a sandy shore after the lock for our lunch spot. It was quite warm today, but luckily we had some cloud cover which helped diminish the intensity of the sun. After lunch, the wind picked up quite a bit and we took some back channels to avoid the wind and waves generated on the wider river. The back channels add more miles but are worth it if they do not dead end. We stopped for a break at the state line between MN and IA. It was a big moment for us, since we have been in MN this whole trip so far. 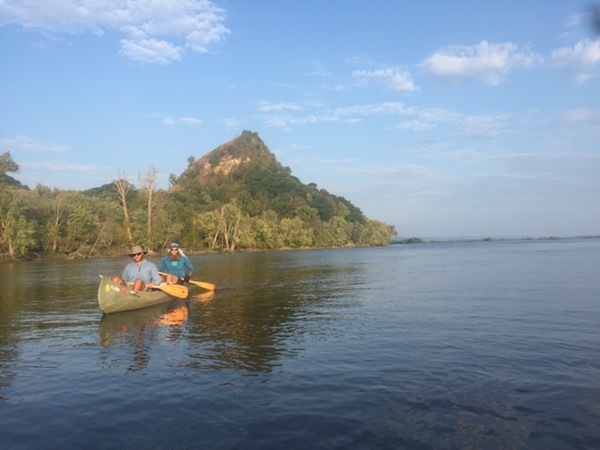 There is no other state on the river where we will spend so much time. It was another confirmation that we are making progress! We ended up ending earlier than we planned, since we came upon a spot that looked like it would be good camping. It is a great spot, with plenty of flat spots for tents and good trees for hammocking. As we sat on the sandy beach having dinner, the cooling temps and nice breeze made for a good evening. While eating dinner, a barge passed in front of us…it was the first barge we had seen all day! We are back in the sweltering heat wave, which we still can’t believe is happening at this time in September. Not only was it hot when started out this morning, but it was so humid. It’s not a good sign for the day if we’re already sweating at 6:30am. 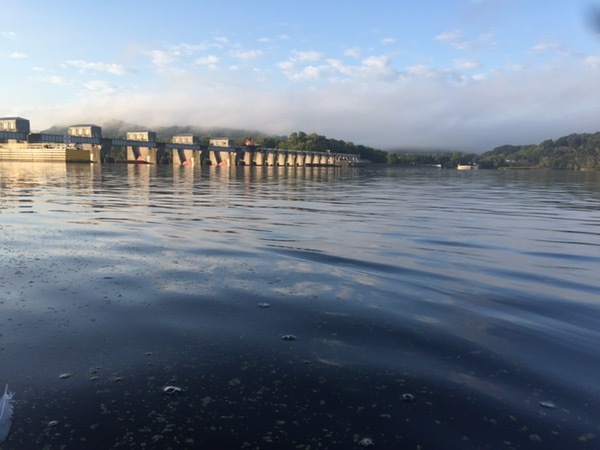 This morning the river opened out into a big lake (Lake Winneshiek) which we paddled through for most of the morning. We have been told that the stretches of river between locks are called “pools” which is quite apt, as we pretty much lost all our current once the lock system started. Our speed is pretty much back down to 4 miles per hour. When we got to the lock 15 miles in for the day, there was already a barge being locked through, so we had to wait for an hour and half. We were able to pull up on a rocky shore to get out and stretch our legs while we waited. It was a pretty smelly area, and we were just 40 feet from train tracks (there were five trains that came through while we waited), but it was still nice to stand for awhile. The locks are a current frustration, as we feel like we lose so much time at them. It is a total crap shoot if we can go through right away (usually means the whole process takes 20-30 minutes) or if we have to wait two hours. After locking through, the river on the other side of the lock was really windy (we must have just been sitting in a protected cove while waiting for the lock). The wind was really fierce and we just headed to the nearest land for lunch. When we arrived, we weren’t even sure if we would continue, since none of wanted to paddle in such harsh wind. We ended up waiting an hour and a half, before deciding to head out on the parallel sloughs (there are a lot of islands in the river, creating smaller channels which are parallel to the main navigation channel) which we figured might be more protected from the winds. The sloughs were actually mostly nice and reminded us of paddling in northern MN when the river was still small and quiet. When we got back to the main navigation channel, the wind was back with a vengeance…it didn’t help when a speedboat circled us at a high speed and created a huge wake we had to deal with as well. We decided to continue on, just hugging the shore where the wind was milder. We finally put this day out of its misery around 5:00pm when we found a good campsite (it is lined with poison ivy, but the interior is clear and flat). We were all exhausted and super frustrated with the day…when we can’t get the miles done that we know we’re capable of at this point in the trip. We checked the weather for the town we were camped near and saw that it was currently 93 degrees…ugh. It was at least nice and breezy on the sandy beach while we ate dinner. We are all in our beds by 7:00pm again. It is still quite steamy out, but hopefully we’ll be able to manage a good night of sleep. It stayed steamy overnight and it was clear that it would be another scorcher today. The river was calm and quiet in the morning. It was a nice time of the day. We have been seeing a lot of fishing jumping and turtles poking their heads up in the water. Those things provide us with entertainment during the day. We realized during our morning break that our original plan to resupply in Dubuque would be tricky since there wasn’t a grocery store near the municipal harbor. So, we decided to resupply at our next town, which was Guttenberg, about 20 miles in for the day. We made good time, arriving at the Guttenberg lock at 11:30am. We had to wait about an hour to get through, but luckily we were able to wait in some shade in a park next to the lock. That was pretty nice, since it was so hot and humid out. Once we got through the lock, we stopped at the first restaurant and were able to tie up our canoes in a area which seemed pretty safe and out of sight. The food was good, but rather pricey for the portions. A place for tourists. 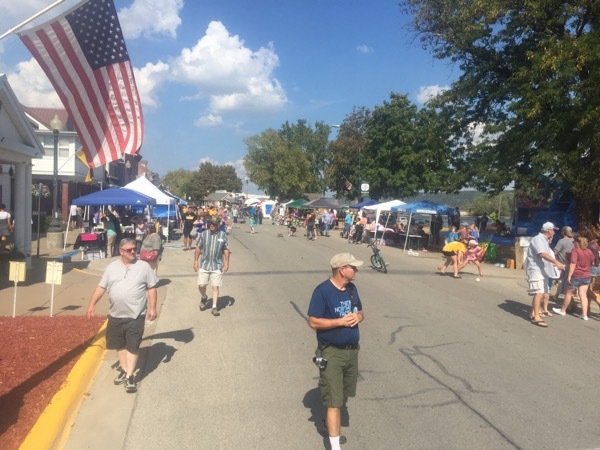 Also the town was having German Fest, so things felt extra touristy….and hot – the town with the asphalt felt so warm. After lunch we did our grocery shopping and then headed back out on the river around 3:00pm.